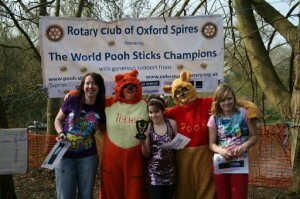 The annual World Pooh Sticks Championships will take place on Sunday 7th June 2015 at Langel Common in Witney, Oxfordshire. The event started in Little Wittenham, Oxfordshire, when the lock keeper at Days Lock noticed walkers recreating Pooh’s pastime on the River Thames. The lock keeper hit upon the idea that this would be an excellent way of raising money for his favourite charity, the Royal National Lifeboat Institution (RNLI). The event soon took off and following the lock keeper’s retirement, the Rotary Club of Sinodun took over the running of the event for many years, until the 25th anniversary in 2008. 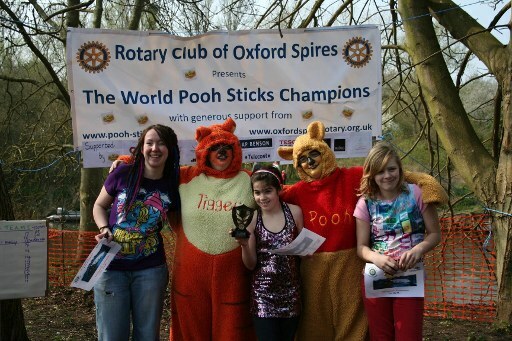 The baton (or Pooh Stick) was then passed on to the Rotary Club of Oxford Spires in 2009, who carry on this quirky event, raising around £3,000 each year for charity. 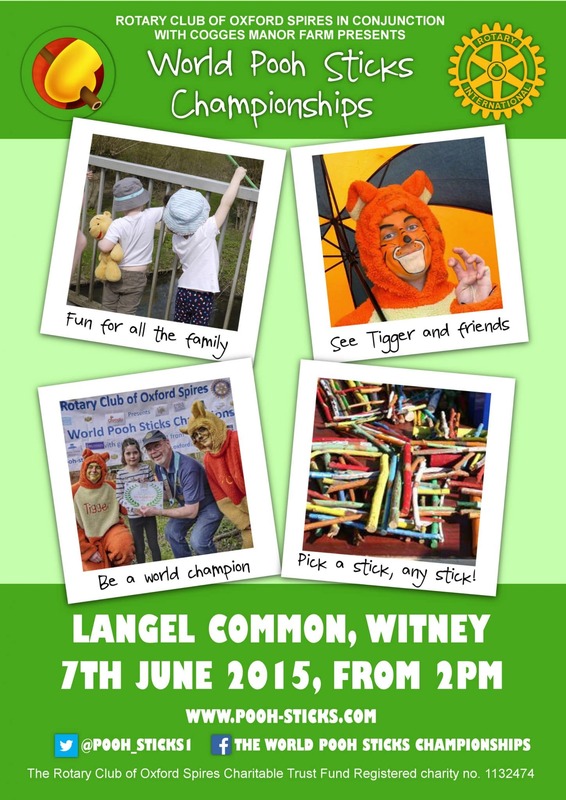 This year’s event will take place at Langel Common, Witney, and will see the Guinness World Record Holder of the ‘Largest Winnie The Pooh Memorabilia Collection’, Deb Hoffman, travelling from Wisconsin, USA to play in the Championships. The rules for playing Pooh Sticks are fairly simple. First you need to select a stick and show it to the other competitors. Competitors stand side by side, facing upstream, and hold their sticks out in front of them. The starter shouts ‘ready, steady, go’, and the sticks are thrown into the water. Competitors then cross the bridge and look to see which pooh stick appears first. This year the Rotary Club will be working alongside Cogges Manor Farm, who are organising a Stick Day to join in with the fun, as well as with St Mary’s Cogges Church who will be providing refreshments.